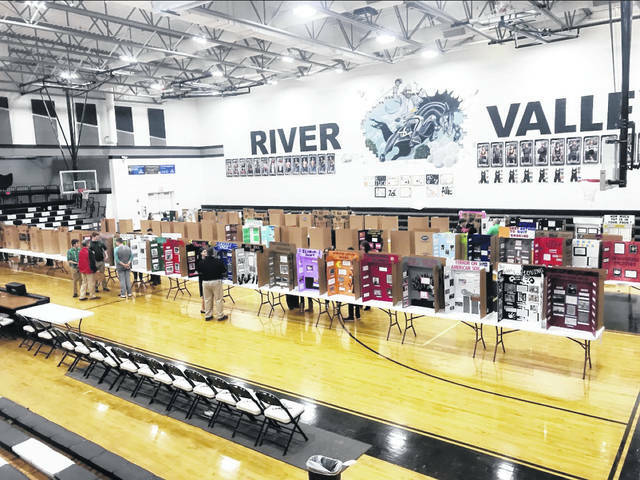 Pictured are River Valley High School Academic Festival projects in the school gymnasium. BIDWELL — River Valley High School students recently took part in an Academic Festival, where they focused their projects around questions of science or social studies. Projects are geared towards students in college preparatory courses. The festival at RVHS is school-wide. Students from outside Gallia and from across the region are anticipated to come to the respective academic days at Rio as well. Those who receive high ratings at the district events can move onto a state level. Roughly 165 students take part in the festival at RVHS. Davis said projects could qualify for presentation at the Gallia County Local Schools Arts and Sciences Gala. The Raider Review’s student journalists from Kaleigh Cox’s class covered the day’s events. Jerilyn Darst and Courtnie Provens: Griswold vs. Connecticut (100 percent), Evalena Ehman: Tinker vs. Des Moines (99 percent), Jade Douglas, Josh Farmer and Abby Justus: Roe vs. Wade (98 percent), Morgan House: Texas vs. Johnson (98 percent) Kaylynn Sturgeon and Alex Wood: Tinker vs. Des Moines (96 percent), Chantelle McClain-Brown: Brown vs. Board of Education (96 percent), Derek Reese and Ryan Snyder: Reynolds vs. US (96 percent), Hayden Kinney and Jacob McGee: Gideon vs Wainright (96 percent), Brady Dawson: Miranda vs. Arizona (95 percent), Jared Reese and Kaylee Gillman: Roth vs. US (95 percent). Courtney Provens and Jessika Hall: Which liquid removes rust the best? (100 percent), Cierra Roberts: Hemophilia Type B (100 percent), Destiny Dotson: Huntington’s Disease (100 percent), Eric Weber: Hemophilia (99 percent), Tristin Riley: Allergens in air between home and school (97 percent), Jayla Sargent: Phenylketonuria (94 percent), Hannah Johnson and Chase Caldwell: Can dogs see color (93 percent), Adrianna Powell: Down Syndrome (90 percent), Skylar Jones: Williams Syndrome (97 percent). Ian Swisher, Braden McGuire and Cody Wooten: Crash of 1970, Ashes no Glory (100 percent), Young and John Santos: Atomic Bomb (99 percent), Morrisa Barcus and Case Stidham: the Fight for Loving (98 percent), Ethan Schultz: 77 3rd Tank Destroyer Battalion (98 percent), Jaydyn Armstrong: Resolve of the Russian People (97 percent), Erika Justice: Smallpox (97 percent), Lauren Twyman: Little Rock Nine (96 percent), Jake Mays: Desert Storm (97 percent), Landen and Levi Dodrill: Nazi Art Looting (96 percent), Matthew Witt: Buried Secrets (96 percent), Grace Hash: Salem Witch Trials (94 percent), William Hash: Christopher Columbus (94 percent), Mersadez Cochran: Salem Witch Trials (94 percent), Brooklynn Sizemore: WWI Nazi Theft (94 percent), Allie Holley and Lexie Taylor: Elizabeth Smart (94 percent). Hannah Jacks and Dalton Jones: Mold Growth (100 percent), Aislynn Bostic: After the Dishes (100 percent), Amanda Velasquez: Stroop Effect (100 percent), Libby North and Alison Roush: How Aspirin affects plant growth (99 percent), Jayden Armstrong: How well do antiseptics work? (97 percent), Dalton Mershon: Supercooling water (97 percent), Ilo Dodson and Jacob Mays: Wood gasification (97 percent), Brooklyn Sizemore: Aluminum and composite bats (97 percent), Kelsey Price: Manure (96 percent), Taylor Ramey and Megan Spencer: How many germs are on a person’s hand? (95 percent), Isaac Barrett: How do varying colors affect the grow rate of marigolds? (95 percent), Cody Wooten: The effect of temperature on resistance of copper wire (95 percent), Lauren Twyman: How fears change with age (94 percent), Seth Jones: Does apple color and pH level affect sweetness? (93 percent), Katlyn Clark: Do magnets affect regeneration? (92 percent).